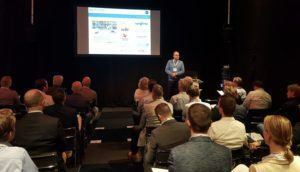 During the seminar Hans Pannekoek, GS1 Specialist at Type2Solutions, showed how you can meet the GS1 Standard in 4 steps using practical examples. John Triel, IT Manager at Total Produce, followed by explaining how they brought the standard into practice. Total Produce is a specialist in overseas fruit and uses the Palletlabel + EDI SaaS Solution of Type2Solutions with which they optimize their logistic chain, delivering to the leading European retailers. Hans, how do you support organizations with GS1? Type2Solutions is an implementation partner of GS1. We help organizations with implementing the GS1 standard when it comes to product identification, barcode labelling and data exchange. We do this with our data- and label management solutions. Among others, our satisfied clients include Total Produce, Pelican Rouge Coffee Roasters, Erasmus MC, Ahold Delhaize and Nedzink. How would an organization meet the GS1 standard? It all starts with registering with GS1. Afterwards you can provide all your products with a product identification number that is unique worldwide. The third step is to translate this unique number (GS1 product number aka GTIN), to a barcode and to put this barcode on the product along with other relevant product information. The product is now recognizable and scannable at cash registers. The final step is to exchange relevant product data with your clients through Electronic Data Interchange (EDI) messages, preventing mistakes and manual administrative work in the logistic chain. What is an SSCC label? What is the ‘00’ that’s part of the text underneath the SSCC-barcode. Why do retailers request the GS1 label in combination with the GS1 dispatch message?